51 Mile was occupied by a large number of units, probably more field units than anywhere in the NT apart from Darwin itself. The 3rd Infantry Brigade HQ (top left), 13 Infantry Brigade HQ (AIF) (bottom left) 10/48 Infantry Battalion (unknown), 11th Infantry Battalion (top right), 2/14 Field Regiment HQ (AIF) (bottom right), 1st Field Regiment HQ and the 11 Field Regiment HQ (AIF) all camped at this site at various times during the war. Like 48, 48.5 and 49 Mile, the main area of the camp site is situated on the slopes of the ridge running north south, and extends down onto the plain on its western side. The site contains extensive build/tent foundations and terraces, bores, wells, showers & washing areas, toilets, slit trenches, garden terraces, generator pads, stone pathways, workshop areas, light anti aircraft positions, cooking areas, a sentry post, barbed wire entanglements and trip wires. AA troops stand ready at their 40mm gun as General Blamey inspects soldiers at 51 mile parade ground which was located at 51.5 mile on the eastern side of the north south road. An anti-aircraft position located on the top of the ridge, still bearing the mount for either a Lewis or a Bren gun which can be determined due to the width of the mounting lug. I am unsure as to whether sandbags were used in its construction and have consequently rotted away, or if it was constructed using material from local ant-hills. The threat from low flying enemy aircraft to troops camped at 51 Mile was ever present and was realized in March 1943 when Zero’s strafed Coomalie field (54-55 Mile) only 3 miles away. Note the fitting for a Lewis Gun. Author’s collection, 2015. Soldiers man a Lewis Gun in a sandbag emplacement in the Darwin Fortress area, 1941. Early in the war, most Australian light machine guns present in the NT were Lewis Guns left over from the First World War. Overseas forces had priority when it came to the Bren Gun. 51 Mile camp contains many slit trenches which further demonstrates the ever present threat from air attack. Most can be found on the slopes of the ridge and some are in quite good condition. Others have all but disappeared due to the 70 years of wet seasons since their construction. Many terraces and foundations dot the camp site. Most of the terraces can be found on the western side of the ridge and are constructed from local rock and in some cases have concrete or bitumen covering their surface. Most of the concrete foundations that are found at the site are located on the flat area of land to the west of the ridge and many are built quite high above the surface of the ground, testament to how water logged the area can become during the the wet season. A terrace that once supported a building constructed of bush timber and iron. A large concrete foundation with a shower area in the foreground at right. Note the thickness and height of the concrete above the ground. A tent terrace constructed from local ‘Laterite’ stone. Laterite has been a popular building material throughout history and it appears in all ww2 tent sites in the NT where ever it is found. The US Army in particular seemed to be very fond of this stone and many of their camp sites are located where it is in abundance. The remains of Laterite stone wall on a tent terrace. 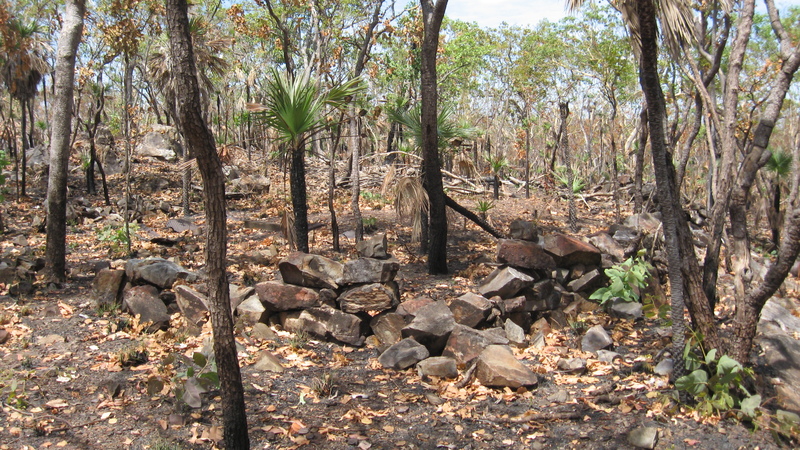 As in all WW2 sites in the NT shower sites are in abundance due to the nature of the climate and the environment. This shower foundation is one of the most solidly build showers that the author has seen. Soldiers constructing the foundation of a shower, NT 1943. Soldiers are wearing the so called ‘giggle hat’. There are a number of bores on site. Most have shower, washing, generator and pump foundations close buy. A bore with metal pipe still in situ. Like showers and foundations, generator pads constitute one of the more prevalent and noticeable structures to that remain at these camp sites. They have survived better than other structures sue to their robustness of their original construction. Generator pads are normally easily seen from the highway, even during the wet season, and are a good indication of the presence of a camp site. This generator pad still retains some of the metal mounting rails where the engine would have sat. Some of these generator units were simply truck engines bolted onto the concrete pads and hooked up via the drive shaft to an electric generator to provide electricity for the camp. Due to the size of the camp, there are many toilets that remain. Most are located on the flat area to the western side of the ridge. The remains of washing troughs can also be found at the site. These would have been used for a multitude of cleaning chores. Two ‘thunder boxes’ with the seat lids still attached. A washing trough constructed from half a 44 gallon drum with two improvised handles either side. This trough would have been placed on the top of another half 44 gallon drum and used to heat the water inside. See picture below. Soldiers wash up their mess tins, plates and cutlery after a meal. Note the stoking holes cut into the 44 gallon drums to allow the fires burning underneath the troughs to be tended. 44 gallon drums manufactured by ‘Rheem’ and dated 1941. A few of the terraces located at the site have sections cordoned of for use as small gardens to supplement rations. Some of the gardens however have decorative purposes in mind. It is sometimes the smallest and less significant of structures that bring out the ‘humanity’ of the site and serve as a true reminder as to the people that once lived at 51 Mile. A flower bed constructed from local rock. A sand palm (Livistona humilis) now grows in its center. Some areas of the site, particularly the southern areas, contain barbed wire entanglements which are constructed from star pickets and barbed wire stakes. It is unclear as to whether these entanglements were intended for a training course or if they were integral to the local protection of the camp site. A barbed wire stake found at the site. Most are in relatively good condition and could be use again. It is believed that this is the remains of a guard post which protected the western entry into the camp. It is located next to one of the old access roads into the site and is constructed of rock. Some of the structure has deteriorated over time making it unclear as to its actual purpose. A sentry position at the entrance to a camp site in the NT, 1943. The post has been constructed of bamboo and local timber. Corrugated iron culvert material has been used to construct the roof. This style of culvert can be found all along the fringes of the Stuart Highway today, most having been bulldozed when the new Stuart Highway was constructed. Note that the censor has blanked out the colour patch.